Merriwa’s 27th annual June long-weekend festival has raised a fleece-load of funds for the Westpac Rescue Helicopter Service and the town’s homegrown Volunteer Rescue Association (VRA). 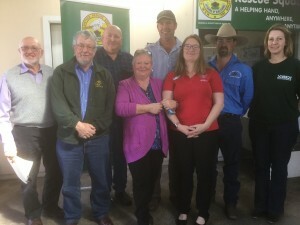 On Sunday 13 August the Festival of the Fleeces committee presented a $4000 cheque to each of the rescue services in front of about 35 people at the VRA shed in Merriwa. Chair of the Festival of the Fleeces Committee, Upper Hunter Shire Councillor Ron Campbell said the people of Merriwa liked to work together. “The Westpac Rescue Helicopter Services and the Merriwa VRA provide assistance to the community in times of need and the Festival is proud to be able to provide sizeable donations to these two fantastic community organisations,” He said. Festival of the Fleeces committee member Deirdre Peebles said the increased amount was ‘very pleasing’. “The festival is improving all the time, there are so many people involved. Our donations were certainly an increase on what we’ve been able to give in the past,” Deirdre said. On accepting the cheque, the VRA’s Sally Hagley thanked the festival committee for its support, saying the VRA was in turn very supportive of the festival. “The money will be used to upgrade existing equipment or purchase new equipment,” Sally said. The Merriwa VRA is a voluntary organisation and does not receive government funding, relying solely on donations and fundraising activities. This year’s Festival of the Fleeces theme was ‘True Blue’ and people were encouraged to dress in blue for the opening night. The event featured Bush Poets and the Hanging of the Quilts as well as the striking flock of sheep fitted out in red socks that led the parade down the main street. Last year the Festival of the Fleeces committee presented cheques for $2500 each to the VRA and the Westpac Rescue Helicopter Service. Testament to the strong and helpful spirit of Merriwa’s community members, a local Westpac Helicopter branch has also been formed. CAPTION: Cr Ron Campbell, James Constable, Sean Deasy, Lenore Taylor, Richard Magna, Peta Luke, Brendan Walters and Sally Hagley at the cheque presentation held on Sunday 13 August 2017.